Race to Rugby World Cup 2019™, Japan, starts in London. London, February 2: Today cyclists Ron Rutland and James Owens will begin their remarkable quest: to cycle 20,093 km through 27 countries, as part of a unique initiative to give disadvantaged children in Asia the opportunity to take part in sport and learn vital life skills through rugby for development program ChildFund Pass It Back. 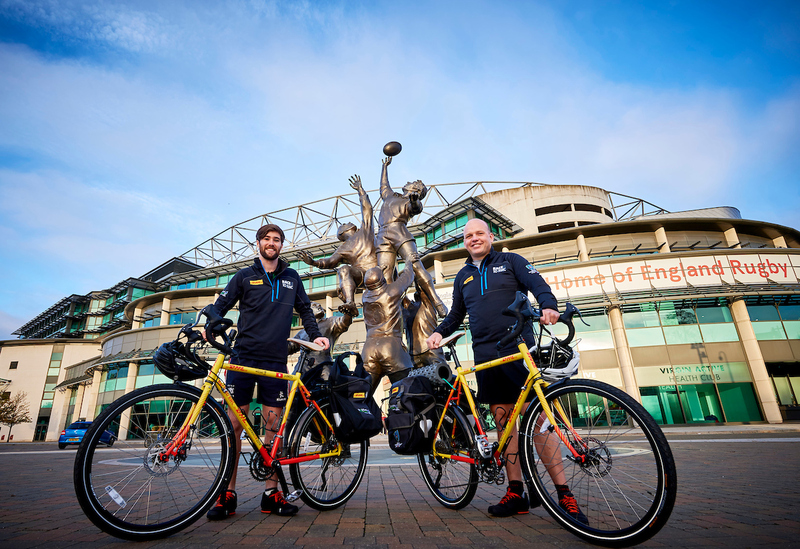 Setting off from Twickenham today, Ron and James will spend 231 days on the road in Europe and Asia, with DHL, official logistics partner for Rugby World Cup, providing essential support for this mammoth journey. This morning Head of Rugby World Cup, Alan Gilpin will present both Ron and James with the official match whistle to the opening Rugby World Cup 2019™ match between Japan and Russia which the guys will courier from Twickenham Stadium – home of the 2015 Rugby World Cup™, all the way to Tokyo Stadium, Japan for tournament kick off on Saturday 20th September 2019. DHL will track the match whistle through each of the 26 countries allowing fans to follow this unique countdown to Rugby World Cup 2019™. Ron Rutland, who cycled through Africa to reach the Rugby World Cup™ in England in 2015, is excited about this new adventure: “We’ll have the challenge of a European winter, crossing the Himalayas (twice), the mountains of Asia to negotiate in the middle of summer, and every type of terrain and weather in between. For James Owens, a former staff member of ChildFund, the trip has significant personal appeal. Having helped to establish the ChildFund Pass It Back program in Asia, he is keen to see the program expand to more children. CEO of ChildFund Nigel Spence adds: “We believe that every child should have the right to play, learn and grow, and the funds raised by Ron and James will help children who face significant challenges around poverty and inequality.